This Friday, revelers from across the western world will gather with their Irish friends, clad in green, to celebrate the “Patron Saint” of Ireland. Wherever the Irish diaspora can be found, you’ll be able to smell the wafting odor of corned beef, Guinness beer and hear the sound of raucous laughter or perhaps an Irish drinking song. “Kiss me, I’m Irish” will be said more times than ladies will have interest, and shamrocks will hang from tavern ceilings. In spite of the popularity of this holiday, few grasp the significance of its namesake. A high-ranking Irish politician in the Democractic Unionist Party (DUP) called Patrick a Protestant back in January, and it was scandalous enough a claim to make the national papers. 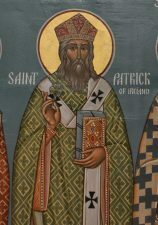 Granted, Patrick lived a millennium before the Reformation – and thus the chortles and snickers from the Roman Catholic Irish majority – but the ‘social development minister’ was only trying to make the point that their Patron Saint wasn’t beholden to the Pope or the Pope’s religion. A similar comment by another notable DUP politician in Ireland came the same month, and it was equally as scandalous. Of course, the Presbyterian Church in Ireland has made the claim for years, and perhaps none as articulate as one of our most favorite fiery Protestants, Ian Paisley.